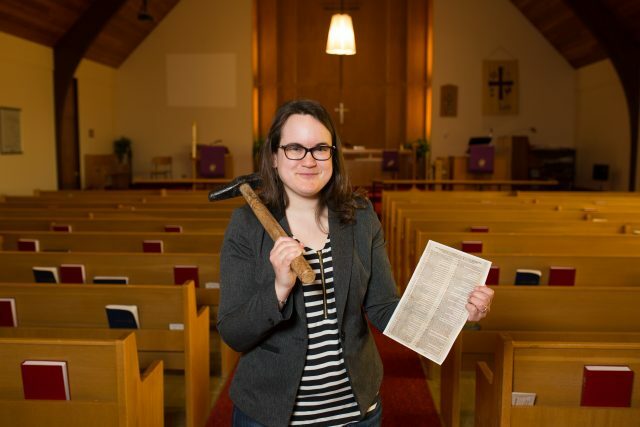 Deanna Smid poses with a hammer and a replica of Martin Luther's 95 Theses in Brandon's Redeemer Lutheran Church. Smid was commissioned to write a series of plays to commemorate the 500th anniversary of the Reformation. What gift do you give for a 500th anniversary? That was the question facing the Canadian Reformed Theological Seminary (CRTS) and Covenant Canadian Reformed Teachers College (CCRTC) as they looked ahead to one of the more significant anniversaries in religious history: Martin Luther’s 1517 challenge to the Roman Catholic Church. The story is famous. Luther, a German monk and professor of theology in the town of Wittenberg, came to tire of the then-common practice of selling indulgences — a type of forgiveness of sin — to raise money for the Roman Catholic Church. Finally, on Oct. 31, 1517, he outlined his objections and sent them to his archbishop, under the title The 95 Theses or Disputation on the Power of Indulgences. This ignited a firestorm of controversy, leading quickly to his excommunication from the church, and eventually, to the splintering of the church itself, launching what is now known as the Reformation. Today, the Reformation is credited for bringing into being many of the main branches of Protestantism, including Lutherans, Anabaptists, and the Reformed — and thus also CRTS and CCRTC. When CRTS and CCRTC embarked on their project of commissioning works art to celebrate the Reformation’s 500th anniversary and its lasting impact, they also wanted to engage people in the research, creation and enjoyment of the art itself. Deanna Smid, an Assistant Professor of English and Creative Writing at Brandon University, was selected to take up the challenge. “She has a very high reputation — for creativity, historical accuracy and research, for humour — a whole package,” Van Raalte said. What she produced are a series of five short plays, the Reformation Playlist. Linked together by theme, they take a serious, yet light-hearted look at how the Reformation might have been experienced as it happened to ordinary people, five centuries ago. “I took a lot of poetic license but these are, as much as possible, accurate,” she said, adding that she included history in the plays that wasn’t widely known, with a focus on women in the Reformation as well as people who have been somewhat forgotten. The plays are peppered with quotations she’s taken directly from letters and publications, many of them footnoted with additional information or citations. The five plays vary in approach to production so that just about any troupe can find something they’d be able to perform. The freedom to explore a wide variety of topics and approaches was part of the original commission. 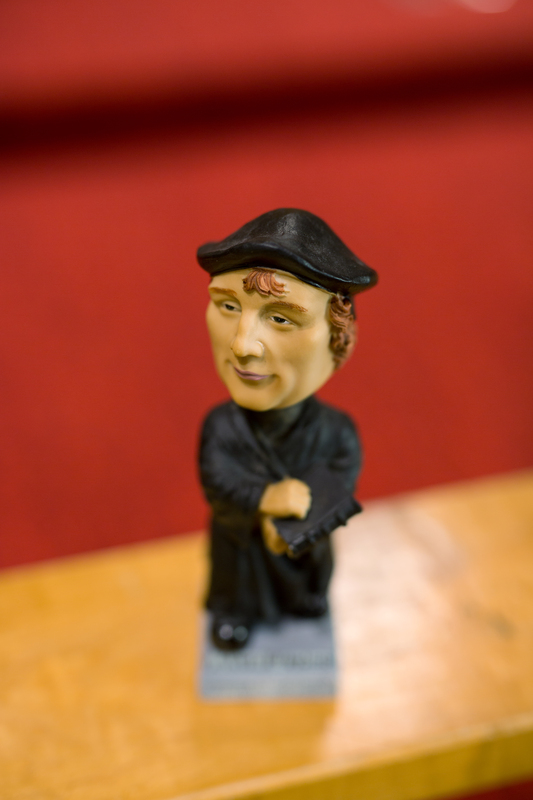 A Martin Luther bobblehead, from Deanna Smid’s collection. Smid’s plays are not just historically accurate and a contribution to the arts — they’re also funny, with elements of slapstick, punning, awkward situations and mistaken identity to keep an audience laughing. She said it was a challenge to come up with themes that would link all five plays, but a fun, enjoyable challenge. History may not be clear on if Luther really nailed his 95 Theses to the church door (sources vary), but whether he actually picked up the hammer or not, the resounding impact of his writing quickly connected across Europe. That speed, in part, was thanks to the impact of the still-new printing press, which helped copies and translations of the 95 Theses make their way across the continent in nearly whirlwind fashion. website, where anyone, anywhere in the world can find them and read them anytime of the day or night, they’re also posted legally under an open access agreement. That means no special permission is needed for anyone who wants to perform the plays. “Open means open,” Smid says. “I have been contacted by schools from Ontario to British Columbia who are planning to perform the plays, and one school is translating one of the plays into French. I am excited and honoured that the plays will be opening as part of Reformation celebrations across the country.